When his previous attorney wasn't getting the results Josh needed and deserved, Josh came to T&E. Hear why Josh says Angel and her team "did an awesome job." Josh S.
One of the most powerful works of American literature in the early 20th century is Upton Sinclair’s “The Jungle,” which exposed the dangerous and grotesque food-handling in Chicago’s meatpacking district. The novel was meant to draw attention to the plight of immigrant workers in the city, but it was Sinclair’s descriptions of food handling that caught Americans’ attention. It was said that Sinclair aimed to hit America in the heart, and inadvertently hit it in the stomach. Since then, organizations like the Food and Drug Administration and the Federal Trade Commission were created to maintain standards and to protect consumer rights. That said, with the far-reaches of vast and rapid industrialization that can affect water quality, unsanitary workplaces, and workers’ poor health, food contamination still happens today. Here are three famous examples. In February 2015, an outbreak of hepatitis A was linked to two brands of frozen berries. The Australian company that distributes the fruit has the product packaged in China, where the contamination is suspected to have happened. Five people were infected with hepatitis A. This week, a jury in Georgia convicted one of the executives of the Peanut Corporation of America on charges of conspiracy, fraud and other federal charges as the result of the salmonella outbreak in 2009 that resulted from contaminated peanut products. Nine people died and another 714 others were made ill by the contaminated food products. In 2006, it was discovered that an outbreak of E. coli was linked to spinach packed at a particular processing plant in California. The outbreak caused one death, 29 cases of kidney failure, and 97 hospitalizations. Product liability is an area of personal injury law that covers injury sustained through the use of a product. 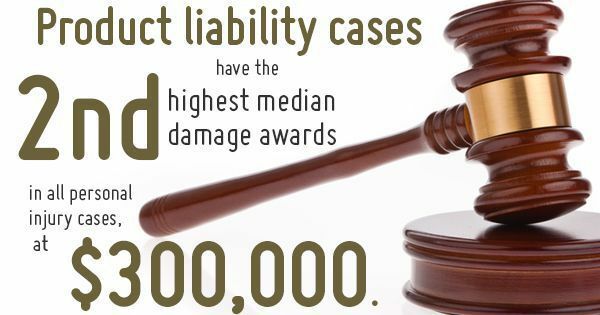 These types of injury claims have the second-highest injury settlements of all types of personal injury claims at $300,000 (and falls second only to medical malpractice which gets about twice that). There are generally three ways product liability can happen: 1) defects in design, 2) defects in manufacturing, and 3) failure to warn. Most food recalls fall into the second category — products are contaminated during the production or packing process. When it does, according to consumer rights laws, the company can be liable for any injuries cause by the tainted food.